Microsoft has been involved with PC gaming for a long old time. That involvement has brought us joy, with classic games such as Age of Empires and Crimson Skies, as well as some pain, with stumbles like Game for Windows Live, Microsoft’s fumbled attempt to replicate Steam’s success. During this time, Microsoft has regularly assured us that it is still committed to PC gaming – and to making Windows the best platform to play games on. 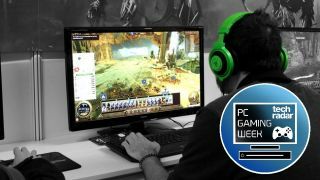 As the creators of the operating system so many PC gamers use for their rigs, Microsoft’s interest in PC gaming is always under scrutiny, especially since the launch of its Xbox console. However, with Windows 10 and the recently-released Creators Update, Microsoft promises that it has made the best version of Windows for PC gamers ever. We chatted to Peter Orullian, Xbox Group Product Manager, about how – and why – Microsoft wants to win over PC gamers. While Microsoft, and Windows, has been a constant presence for PC gamers for a long time now, Microsoft is still primarily thought of as a company that deals with the less exciting things in life – operating systems, cloud servers and office suites. But, as Peter Orullian suggests, Windows 10 is changing all that. "Each update has come with new gaming features and integration. It’s part of our focus now with Windows." Despite Windows being so integral to the PC gaming experience for many people, where it’s necessary to play PC games, Microsoft hasn’t quite cracked selling PC games, whilst rival services such as Steam go from strength to strength. With the Windows Store in Windows 10, Microsoft wants to change this by making it easier for people to find and buy games through the store. Improving the quality of the store has been a big focus for Microsoft and Orullian’s team. Of course, encouraging people to buy through the Windows Store isn’t a completely altruistic aim, and it’s clear why Microsoft would want a slice of that pie. But, making it easier to buy games means more games are sold, and that’s great news for the industry – and for gamers. It’s also commendable that Microsoft isn’t just focusing on making it easy for gamers to buy games, but also for games developers to sell their games. Also, as an added incentive to owners of both an Xbox One and Windows 10 PC, Microsoft’s Play Anywhere initiative lets you buy a game once, and play it on either device. Making a service that’s user friendly and affordable isn’t that easy – as Microsoft knows all too well. In 2007 it launched Games for Windows Live, a service designed to replicate Steam’s success in selling games, as well as bringing online gaming on PC more in line with the Xbox Live service on Microsoft’s consoles. It wasn’t popular. Orullian was there during those times, and is open about the failures of the service, and the lessons they learnt from it. Whatever you say of Microsoft, it certainly appears to listen to its customers, especially recently. The honesty is refreshing, and it’s good to see a company as big as Microsoft acknowledge its mistakes, as well as learn from them. One of the headline features of the recent Creators Update, certainly for PC gamers, is Game Mode, which helps Windows keep check on background tasks when you’re playing games. The idea is that by limiting the resources taken up by other tasks when playing, you should see more consistent framerates. Before you dash off and enable Game Mode, Orullian – and Microsoft – want to temper expectations. When Game Mode was first announced, it captured the imaginations of many PC gamers, and while that’s generally a good thing, it also led to increased expectations from some quarters about what Game Mode could manage. This is something that Microsoft is keenly aware of. That’s perhaps the most exciting thing about Game Mode, and the other PC gaming-centric features Microsoft has brought to Windows 10. This is just the beginning of Microsoft’s rekindled love of PC gaming, not the end.